If there is one thing for sure, it’s that your crockpot can be one of the most useful small appliances you have when you’re camping. It makes easy, one-dish meals which require little clean up and can be controlled to be ready to eat when you’re ready to stop playing. The trend these days is to make a whole batch of crock pot meals in the same day and freeze them to be pulled out as you need them throughout the month. These can be perfect for campers and we rustled up some recipes for you to get started making your fresh from the freezer camping meals. Ginger Peach Chicken – You’ll need boneless, skinless chicken thighs, a bag of frozen peaches, onion, brown sugar, soy sauce, ginger, and coriander for this delicious meal. You can serve it over rice or veggies after it’s cooked for about 5 hours in the crockpot. Mushroom Barley Stew – Add mushrooms, carrots, celery, onion, diced tomatoes, and uncooked barley to this freezer bag. When you’re ready to cook, you can pour veggie stock into the crockpot before you get started. Cook on low for 8 hours and serve it with a nice loaf of artisan bread or flaky rolls. Cranberry-Mustard Pork Roast – This pork roast will be 3 or 4 lbs and you’ll add cranberries, brown sugar, brown mustard, onion, pumpkin pie spice (yes, you read that right), and some fresh orange juice. When cooked it can be poured over mashed potatoes, rice, or steamed veggies. Plan on it being a big hit and it will warm up well for lunch the next day. You can find the instructions for these recipes and others at 12 Make-Ahead Slow Cooker Freezer Meals. 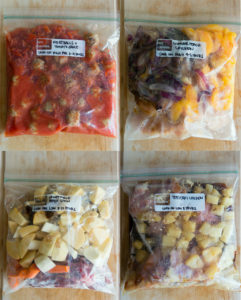 Some tips to remember are to carefully label the freezer bags, don’t add milk, cream, or sour cream until after the meal is cooked and ready to serve, and cooking times can vary. We hope you enjoy many a happy meal when you’re camping. If you make some of these ahead you’ll certainly have more time to play and catch up with friends and family.